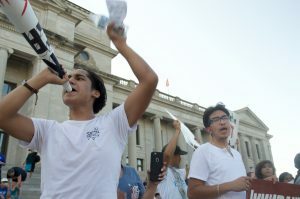 Protesters marched from Central High National Historic Site to the state Capitol on Saturday, in response to President Trump’s announcement that he would end the Deferred Action for Childhood Arrivals. The march was a show of support for DACA recipients and the DREAM Act. The two programs provide legal status to undocumented immigrants who entered the country as minors. Sister Rosa Perez, a Missionary Carmelite of Saint Teresa, and a Dreamer, said that she came to the march to “lift up voices” of other Dreamers. “They can know that we are supporting them, that we are walking with them,” Perez said. Organizers chose Central High as the demonstration’s starting point for its historic significance, comparing the current situation of Dreamers to that of the Little Rock Nine. “Exactly 60 years ago, this was the building where nine young African-American students fought for their right to a good quality of education,” said Central High National Historic Site worker Fabian Ruiz. Upon reaching the Capitol, other speakers addressed the crowd. Many were unauthorized immigrants recounting their own experiences with DACA and the DREAM Act, particularly in terms of higher education. Others attempted to clarify misconceptions that they believe opponents of these programs have. Arkansas is one of 32 states that does not offer in-state tuition to unauthorized immigrants, and most of the speakers voiced the belief that this policy is discriminatory. Among the speakers was Sen. Joyce Elliott, D-Little Rock, who expressed her shared belief in the discriminatory nature of Arkansas’ tuition policies, and told of her commitment to passing the Arkansas Dream Act. “The DACA people who are here are contributors,” Elliot said. Elliot called for those against DACA and the Dream Act to be “open-minded,” and refrain from “knee-jerk reactions,” as she believes the story of Dreamers is “the story of America.” Like the event’s promoters, Elliot said the connection between the Little Rock Nine and today’s Dreamers is a profound one, because both are examples of young people making sacrifices in pursuit of the American dream. On Sept. 7, Trump issued a tweet saying that beneficiaries of DACA had no reason to worry, as no action would be taken within a six-month period. Elliott believes that people who are under DACA can’t be comfortable. Arkansas Attorney General Leslie Rutledge supports Trump’s decision, however, and believes that the six-month period will be sufficient for Congress to address the issue. “While we are a compassionate country, the United States is a country of laws and President Trump recognized that President Obama’s DACA program went far beyond the executive branch’s legal authority,” Rutledge said. Perez is hopeful the president’s statements are true, and is sure that he has “the best desires for America.” Regardless, she feels that Trump’s position on the issue has come to divide the nation, and that Americans should do what they can to work for unity. The protest concluded with a call to action from Fabian Ruiz, invoking the legacy of the Little Rock Nine, and urging the attendees to come together again.